Honestly I really enjoyed Iwata’s speech, even outside of the announcement of the new Super Mario game for 3DS and the new Zelda madness. I listened as closely as I could… at least until the Zelda trailer, at which point I turned to more important priorities – you’ve seen the results. While of course the “big announcements” have already been covered, there’re a couple more pieces of important info that Iwata dropped during his speech that I’ll also cover. He began by talking about the gaming market being economically riskier, but says that through passion the industry can survive. “Content is king” was one of his big slogans. He cited the difference between the original game developers and modern developers: for them it was just a hobby, but now it has become a profession. They’ve gone from being “video game cavemen” to respectable businessmen. One thing that Iwata really wanted to stress is that “social gaming” is not a phenomenon that began with social networking sites. “Social gaming” has been around since before video games even became an industry – it has been present in arcades, multiplayer games, and online experiences for years. It focuses on bringing people together to play either competitively or cooperatively. Iwata thinks that one of Nintendo’s biggest successes has been in the creation of “Must-Have” products. He cites Mario, Pokemon, Tetris, and The Sims as some of the biggest “must-have” pieces of software in industry history. They hope that 3DS will become a “must have” piece of hardware just like the Wii and original DS did, and they plan to do so by offering a combination of new game software as well as features common in other mobile and social networking devices in order to increase its appeal. The improvement of the 3DS display, both graphically and in terms of the 3D effect, also widens the palette of software that can be created for the 3DS. Reggie came on stage and announced that Nintendo plans a partnership with AT&T to create over 10,000 wi-fi hotspots in the US that are capable of transmitting data via SpotPass. He also announced that the 3DS will support Netflix and will be able to transfer movies between the Wii and 3DS so you can watch videos on the go and resume them on a TV screen at home. We also heard that in addition to GameBoy and GameBoy Color titles, the 3DS Virtual Console will also release selected Game Gear and Turbografix-16 titles. 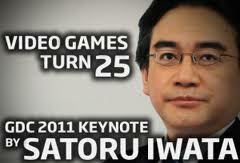 From here, Iwata went on to announce the new Mario game as well as show the new content for Zelda.